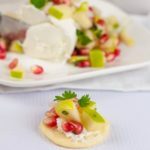 This Goat Cheese Log with Apple Pomegranate Salsa recipe makes an easy, delicious and healthy appetizer or party snack. Perfect for holiday entertaining! Are you ready for pomegranates yet? Nothing says “holiday party” like those little red jewels topping an appetizer or salad. 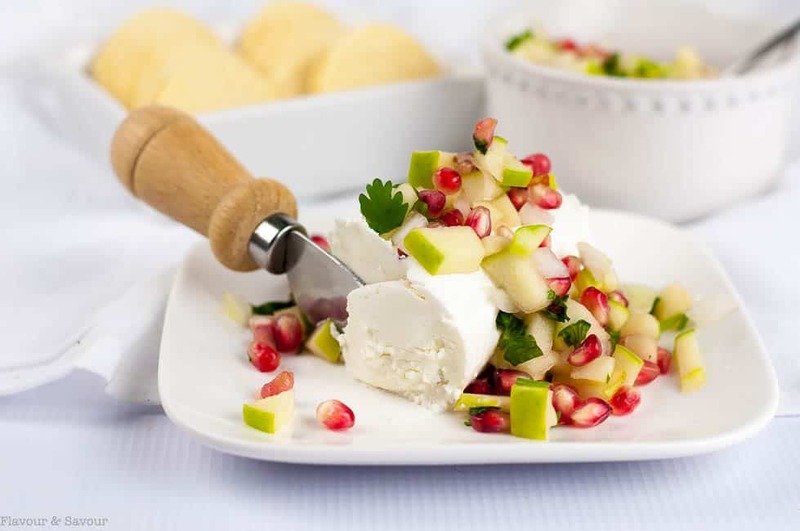 This goat cheese log with apple pomegranate salsa is a simple appetizer, ready to spread on a cracker, or scoop with a pita crisp. So easy, so festive, and so good! I’ve been busy developing holiday recipes lately, and this one was fun to create. 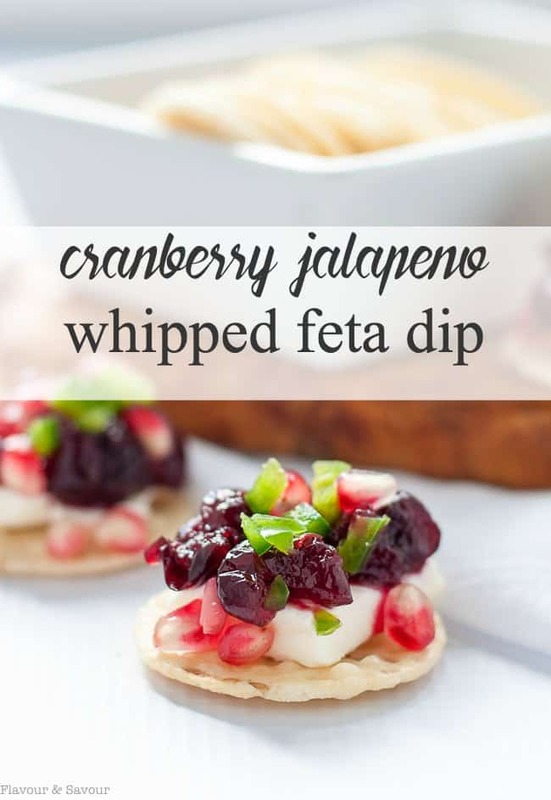 I spotted fresh pomegranates in my local supermarket a few weeks ago and snapped some up right away to make this Cranberry Jalapeño Whipped Feta Dip. When we were invited out for dinner recently, I offered to bring appetizers. I wanted to try something new and different, so I played around in the kitchen making three different kinds of salsa appetizers. This festive Goat Cheese Log with Apple Pomegranate Salsa was one of them. 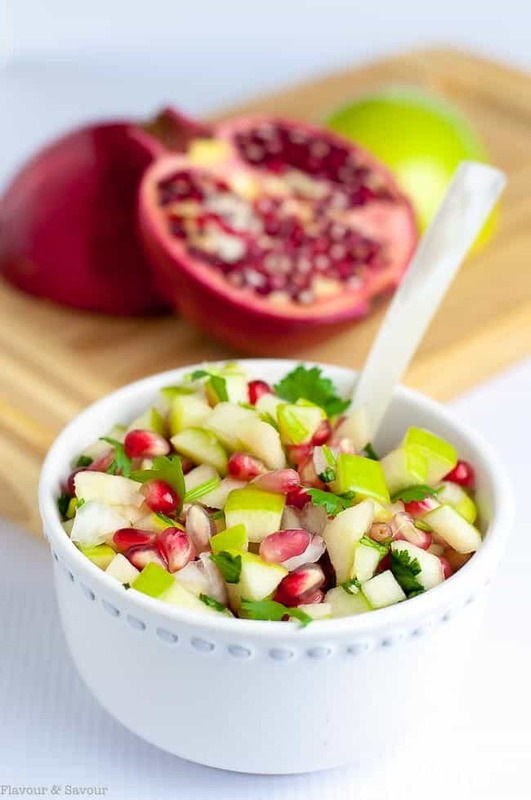 Did you know that pomegranates are nutritional powerhouses? They reputedly have anti-inflammatory and anti-oxidant qualities, and are a significant source of essential vitamins. Since I discovered their value, I’ve tried to add them into my diet in different ways when I can. I made this Crusted Halibut with Mango Pomegranate Salsa last week, and I’m always ready for a glass of Citrus Pomegranate Sangria. 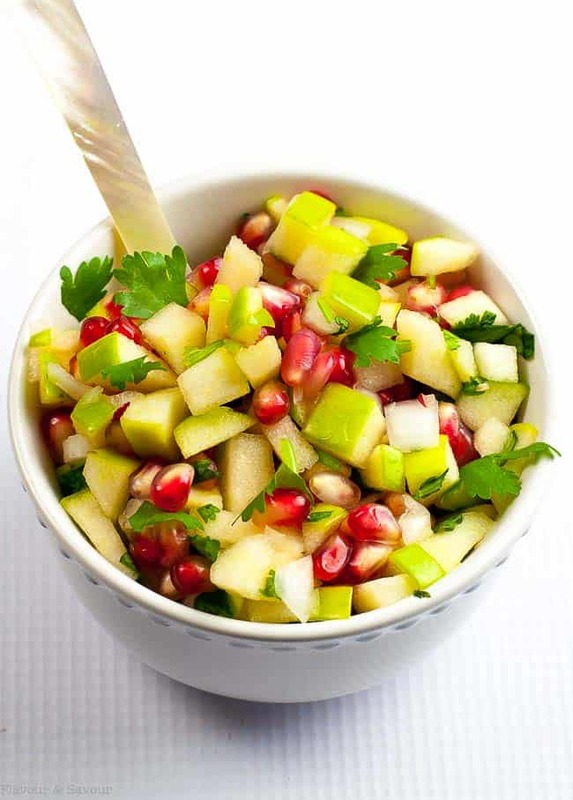 Health benefits of pomegranates and apples aside, this appetizer is a keeper! If you serve it with rice crackers, or other gluten-free crackers or breads, it’s a snack your gluten-free friends can enjoy, too. It’s fresh, crisp, juicy, and sweet but tangy and the salsa marries well with creamy goat cheese. It’s super flavourful, so I suggest that you choose fairly plain or lightly seasoned crackers to serve with it. colourful! Just look at those cheerful colours! This Goat Cheese Log with Apple Pomegranate Salsa makes an easy and delicious pre-dinner snack or appetizer. Perfect for holiday parties. Combine all ingredients except goat cheese in a small bowl. 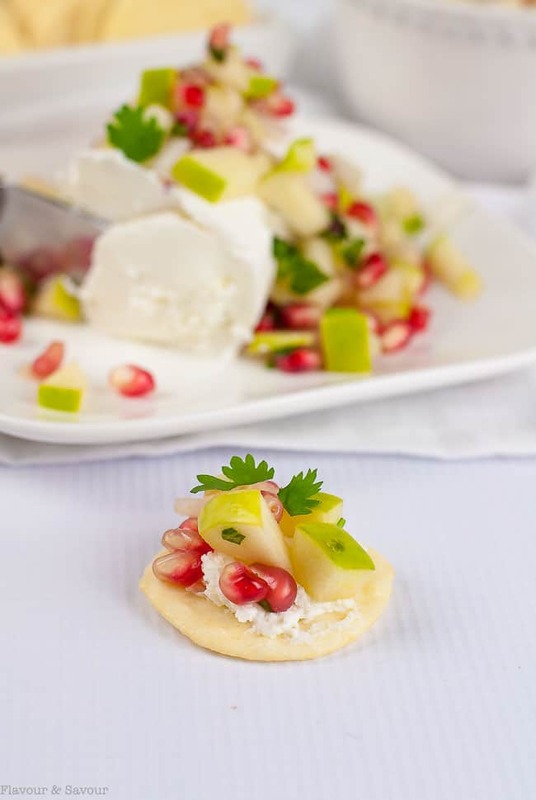 When ready to serve, place goat cheese on a plate, top with Apple Pomegranate Salsa and serve with rice crackers or other mildly flavoured crackers or pita crisps. If you like this Goat Cheese Log with Apple Pomegranate Salsa, pin it or share it! I wasn’t sure how this would turn out when I read the recipe, but WOW! This is a keeper! I served it as an appetizer and it was a big hit. Thank you! Thanks! It gets rave reviews whenever I make it, too! Thanks for stopping by!